The Reichsburg Cochem is a castle near the city of Cochem at the Mosel river in Germany. The Reichsburg Cochem had its first documentary mention in 1130. In 1151, it was occupied by King Konrad III, who declared it an Imperial castle. In 1688, the castle was overrun by French King Louis XIV’s troops in the course of the Nine Years’ War (known in Germany as the Pfälzischer Erbfolgekrieg, or War of the Palatine Succession), and the following year, they destroyed it. The castle complex long lay in ruins before in 1868 it was bought by the Berlin businessman Louis Fréderic Jacques Ravené for 300 Goldmark and then reconstructed in the Gothic Revival style. 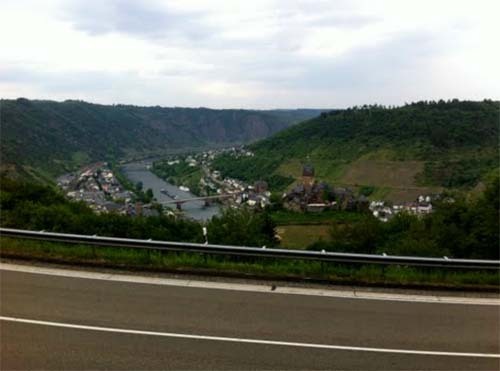 Since 1978 it has been owned by the town of Cochem and is administered by a company named Reichsburg GmbH. Cochem is the seat of and the biggest place in the Cochem-Zell district in Rhineland-Palatinate, Germany. With just under 5,000 inhabitants, Cochem falls just behind Kusel, in the like-named district, as Germany’s second smallest district seat. 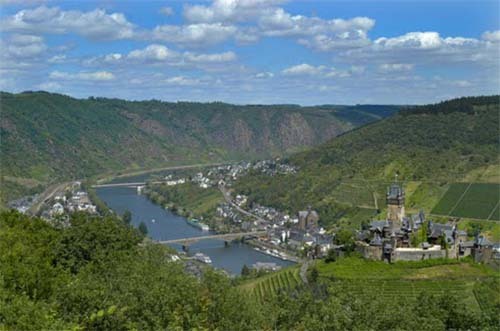 Since 7 June 2009, it has belonged to the Verbandsgemeinde of Cochem. The town centre with the outlying centre of Sehl upstream lies on the Moselle’s left bank, while the constituent centre of Cond lies on its right. 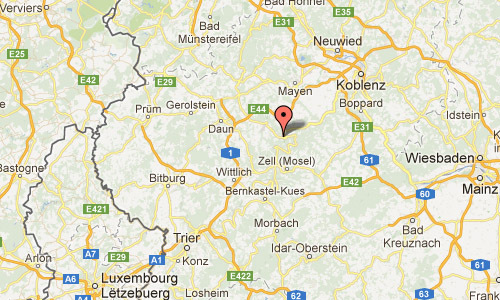 A further constituent centre, Brauheck, with its commercial area, air force barracks and new town development, lies in the heights of the Eifel on Bundesstraße 259, some 2 km (1 mi) from the town centre. Emptying into the Moselle in Cochem are the Kraklebach, the Ebernacher Bach, the Sehlerbach, the Falzbach, the Märtscheltbach and the Enthetbach. The photo was made from Road 259 towards the Reichsburg.